Jake Speer is a graduate of the prestigious NIDA acting program. During his training Jake made a huge impact as Richard in Shakespeare’s Richard III, amongst other roles. Following graduation Jake booked a series regular role on Australia’s highest rating drama series, Home & Away playing Oscar Maguire. 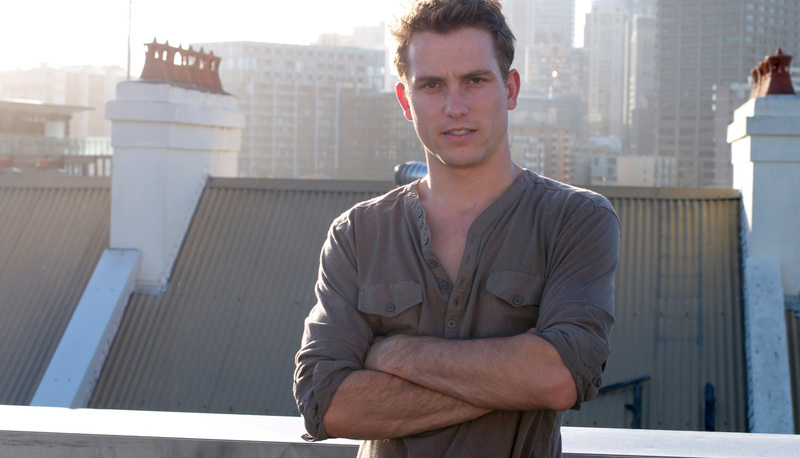 Between graduating from NIDA and signing on to Home & Away, Jake also found time to produce, direct, write and star in the documentary film LEETON: The Formative Years. He studied at a regional performing arts high school and was awarded a Canberra Area Theatre Award for his performance as the Cowardly Lion in The Wiz. Jake was recently seen opposite Georgie Parker in Barefoot in the Park for The Ensemble Theatre. At what age did you know you wanted to become an actor? Acting is something I have always wanted to pursue for as long as I can remember. I guess it was in late primary school when I realised that I could actually earn money from it. That being an actor was a thing. I grew up in Leeton, not far from Albury, with the choice of two high schools and at the time one offered drama as an elective and the other didn’t so the choice was obvious for me. In primary school I was in the choir and did music lessons and that was something I continued with into high school. School bands, music classes etc. When I was 15 and doing community musicals in Wagga Wagga I was asked by the head of drama at Kooringal High School in Wagga to consider moving there and attending the school. They had a very strong arts department there. I decided to make the move and finish my senior years at Kooringal. This allowed me to participate in school productions and gain a lot more experience. Making that move was a defining moment for me. It definitely paved the way for what was to come. That drama teacher, Mr Cox, was one of my first mentors when it came to acting. He introduced me to great plays, great actors, great films. He challenged me on stage and encouraged me to go further and deeper in my performances. I worked with him recently on a one man show we devised. It so important to continue those professional relationships, especially in this industry. When you were completing school and planning for the next step in employment, further education and/or training, what were your plans at the time? I had my sights firmly set on becoming a professional actor. I knew exactly where I wanted to go next. That was NIDA. I didn’t have a back-up, a plan B, a safety net, nothing. That freaked my parents out a bit I think. But they had supported me and trusted me so far; they knew that this was something I was taking very seriously. I auditioned for the 3 year Bachelor of Arts degree in Acting at the National Institute of Dramatic Art (NIDA) in Sydney just after sitting my HSC. After three rounds of auditions and being told that I wasn’t getting in this year, I got in. I was 17 and made another big move, this time to Sydney. When did you feel that you had made ‘your big break’ in the performing arts industry and how have you adjusted to being a public figure? It would have to be Home and Away. It definitely brought with it a spotlight and introduced me to an audience and a following and I don’t think there is a show in this country that can do that as quickly as Home and Away can. I wasn’t prepared for that side of it. Nobody really sat me down and told me how to handle it. I think it’s a very new and unique time now to have a following or be in the public eye because of the way we use technology and communicate with each other. Social media has allowed me to connect with fans from all over the world directly and instantly. That’s never been possible before. I find that incredible. It’s very empowering too. Actors can now self-promote. Advertise new projects they’re working on, events they’re at, crowd fund productions, literally create another cash flow to support themselves. But I find it a real struggle. Some people are very good at managing their profiles and I guess I have just learned from example. Good and bad examples. I had to learn a lot about myself so that I am confident in what I put out there. I do find it can be distracting at times from the work. Sometimes you might be obsessing over stuff online and not focused on the quality of your work. That’s when I know I need to refocus. I learned early on from my father that you are working for a very long time, so why not do something you love. I love acting because it is all about revealing the human condition. My job is to explore what it means to be human. I am always learning something new. Every role I play requires an incredible amount of research. I love that part of the preparation. If I’m doing a period piece I’m reading all about that point in history. If I’m playing a real life person I’m learning all about their life and achievements. The best part is that every experience I have in my life feeds into my work. Every new relationship. Every new place. I get to experience so much of life’s incredible wonders for my work. It makes you incredibly aware of the world. I think being an actor can also give you a great deal of empathy towards humanity. You are constantly looking through the eyes of other people. Feeling what other people feel. The world fascinates me. People fascinate me. So, when I have a “dry spell”, when I’m not working, I have a whole world to explore that will in turn feed my work. Yes you have a find a way to earn money and support yourself but I let that be an excuse to explore a part of the world I haven’t yet. To learn something new. To meet new and interesting people. In between acting jobs I return to writing my own work, films, plays etc., or I will go back to reading the great plays, watching great films and finding inspiration from my heroes in cinema. I have found, recently, that yes it is important to be focused and dedicated to acting and managing a career, but it is also important to take time for yourself, away from acting. To look up and see the world around you. Shift your focus for a moment. Scarily, in the times when I have shifted my attention away from acting, an opportunity quickly comes. An audition. A role. In short, travel, have a hobby, get a job. Live! Because that’s your job as an actor. You are being paid to live. Some young people who are passionate about performing arts don’t pursue a career after school in acting, as they are concerned they won’t have a secure job or career. What advice can you offer young people who are thinking about pursing a career in the performing arts industry? It can be daunting. Acting is definitely not the most secure profession. There are far more easier ways to become rich and famous. And if that is your motivation for becoming an actor I suggest you stop right now. Being an actor requires a great deal of discipline and determination. I highly recommend training at places like NIDA, WAAPA, QUT and VCA. Having a technique, a foundation, from these institutions by no means guarantees anything but definitely better equips you for the diverse demands of an actor. Get use to rejection. This can be hard for the parents to deal with as well. You will hear a lot of no’s. I have heard many even in my short time. But it’s important to learn that it isn’t an attack on you personally or your talent. There are so many factors at play in the audition process that are completely out of your control. Actors should use the audition as an opportunity to grow and learn something about themselves as an actor, meet new people from the industry and above all have fun. Play. This is why having a clear understanding of why you want to be an actor is so crucial, you will need to summon your own motivation to rise above these knock backs and keep charging forward to the next opportunity. Learn to shake it off. Connected with this too is that the career of an actor spans a lifetime. I know I get frustrated at times when I don’t get a part I wanted or see other actors doing awesome plays and movies. But you need to understand that it takes time. A lot of time. Some more than others. Look at the IMDB pages of most leading Hollywood actors today and the time between their very first credit and their first big film is roughly 10 years. That’s how long it can take. So pace yourself. I encourage young actors to create their own work. Grab an iPhone, make a movie, film scenes, write a play, produce a play, put it on somewhere. Do as much as you can. Not only will it teach you so much but it will create momentum. Work creates work. The industry takes notice of people who are proactive. Creating your own work tells people that you are to be taken seriously and that this means something to you. You are willing to work hard to get where you want to be. Be a sponge. Soak up as much as you can about the industry. Actors, Directors, Writers, Producers. What are the great plays, the great films. Film festivals. Websites. Studios. Production Companies. Agents. Casting directors. Know everything! As for the parents, I was extremely lucky to have parents that supported me in following my passion. I would not be where I am without that support. I think support is incredibly important not just for young artists but for young people in general. To be there through the highs and lows, I have found, is the best thing a parent can do. To be full of encouragement so that we may see no limit to where we may go. Though this can be difficult and scary as well. I don’t mean to deter you from pursuing a career as an actor, or any career in the arts, but it is important to know the realities. The odds are against you. It will not be easy. It has to mean so much to you because it will demand so much from you. At this point in my life I have my sights set on Hollywood. I’ll most likely be spending a bit more time over there throughout the next few years. I’d like to do a bit more work here in Australia, on stage, on television, in film. But more broadly I want to be working with incredible people on incredible projects. I want to be challenged and surprised with each new production. I think my ideal would be that I spend a year working on a feature film or series then a play on Broadway or the West End or Sydney and then any spare time in between that I’m travelling around the world seeing as much of it as I can. Everything has a beginning. Start small. Work from where you are at. Find the people and opportunities that are available to you and use them. It all depends on where you want to get to. Know what you want, why you want it and how you’re going to get it. For me, growing up in a town of 8,000, 6 hours from any major city, NIDA was my first major goal. So I knew eventually I had to get to Sydney. And, to be honest, in this country, Sydney is where you need to be. Technology is brilliant. Google people, email people, apply for grants, post short films on YouTube. I have found compromise is a great breeding ground for creativity. If you have restrictions, whatever they maybe, try and turn them into a creative opportunity. You never know what you might create that will take you to that next step. I think the secret to all this is knowing what is important to you. Knowing where you want to go and what you want to do. However clear those answers are to you will determine the direction you head and to what degree of success. But even if things aren’t going your way and you don’t have a clear direction that’s ok too. I know the feeling. That is just where you are at. Remember that it should be fun. So have fun.